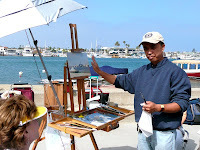 Thanks to the Laguna Plein Air Association, I received a scolarship to take a workshop of my choice. 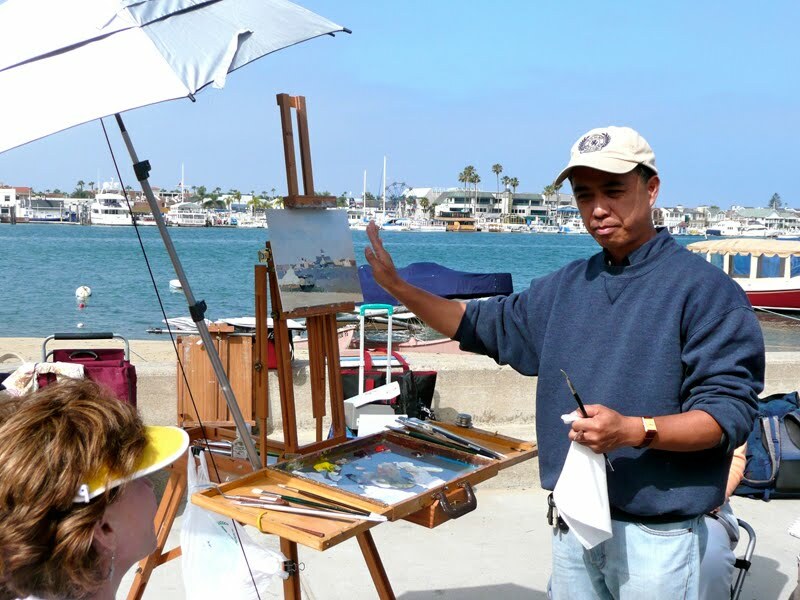 So who happened to be teaching close-by but the master Calvin Liang. 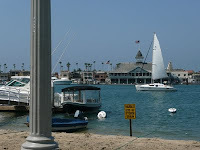 I've always admired his rich luscious masterpieces so I took (even more) time from work and took myself to Newport Beach. - I will try to synthesize some basic points of his amazing demo. 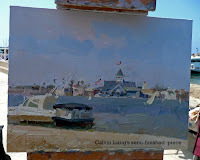 -For starters, Calvin doesn't use expensive or sophisticated materials for his plein air work. His setup feels comfortable like a pair of old slippers. It's what he is used to. There is a message here, it's not the materials that make the painting. 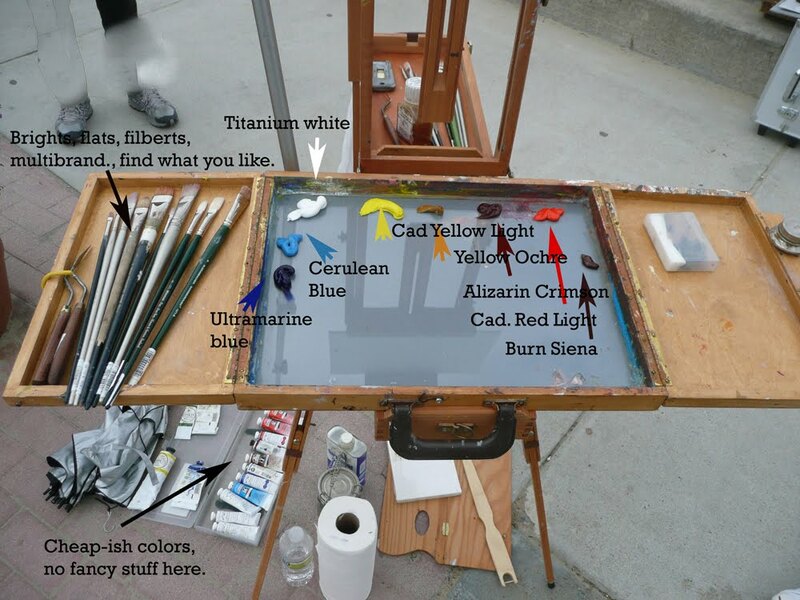 His palette is limited outside, but in the studio he confesses to using a wide palette of up to 23 pigments.I took a picture of his setup and his palette for reference. Nothing fancy. However, Calvin was adamant about one necessary ingredient: "You can't start a painting without a clear design." A concept if you will. 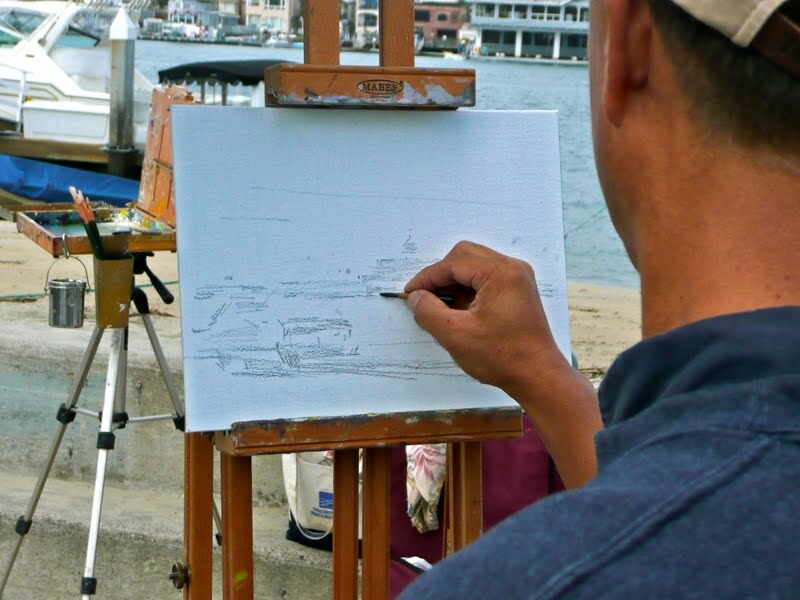 It is good practice to have a design in mind before even touching a brush. Then comes the question of form, color, tone and edges. The only things that can go wrong are those four components and any error can be traced to them . "The only trick is no trick" he answered when queried about that deadly question people always ask.... what color is that?. ... A color is the result of the colors around it and there is definitely no recipe. Calvin basically used the same puddle of color for the whole demo hat took aprox. 1 hr an 30 mins. Calvin showed us his color wheels, some fine examples of his design work and examples of his oeuvre in books and magazines. But soon it was canvas time. First he did a soft charcoal design to be certain of where the elements of the design would be. 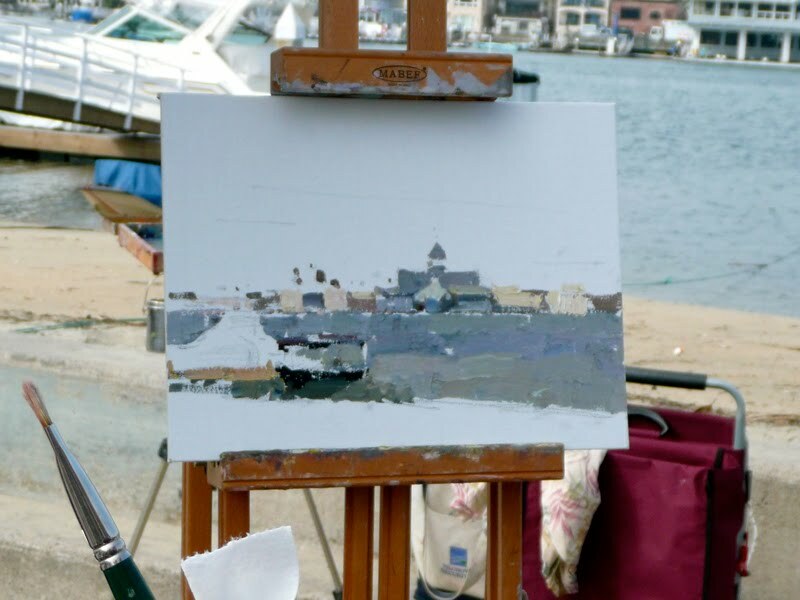 After the drawing, he applied some dark shapes outlining some foreground boats and deep darks. But he had no hesitation moving on to a thick paste for the rest of the canvas. No liquin or turpentine. 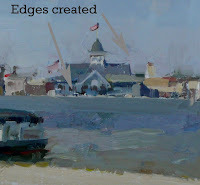 Lying the shapes thickly as if applying tile. The goal is to cover up the canvas and create unity. Calvin never looks at "things", just shapes. 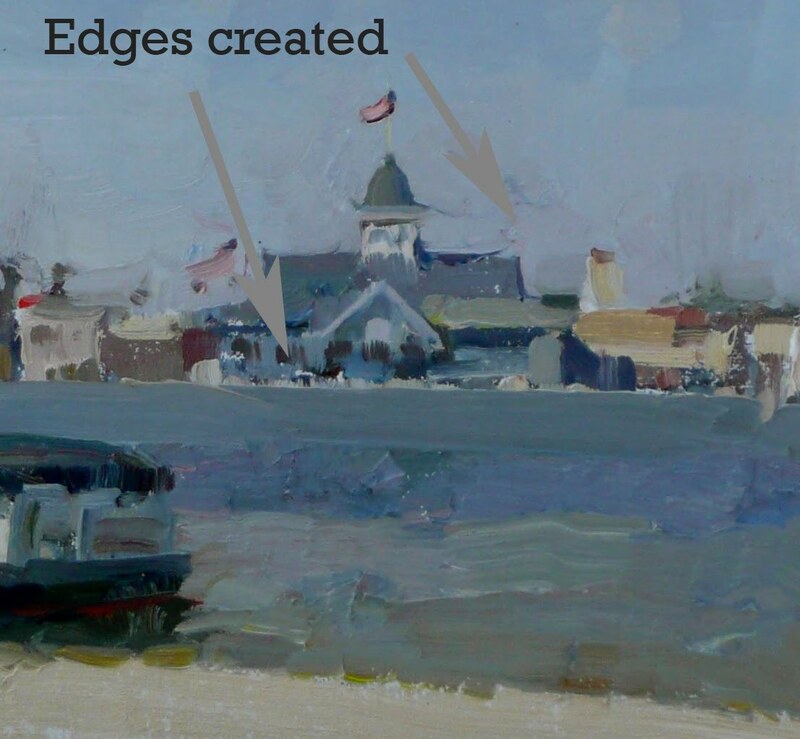 And he creates the shapes with an incredible lack of detail initially. 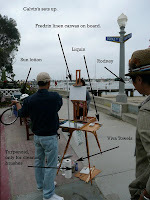 He believes, and I agree, that the detail practically paints itself once the main shapes are laid out. In this demo, there were two clear phases. An initial phase when he just lays and covers color to achieve unity. 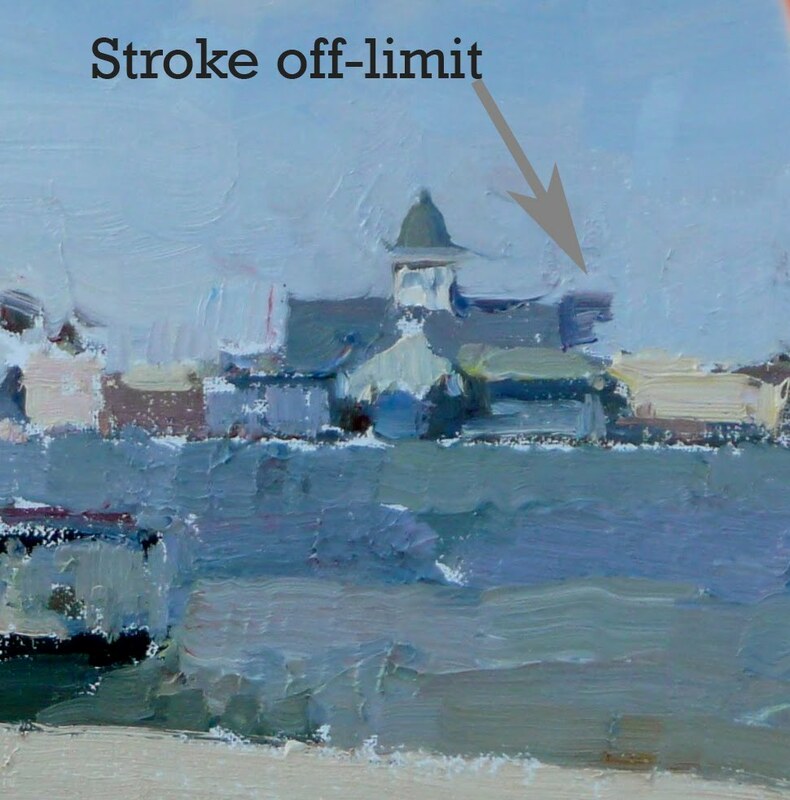 The brushwork has bravado and variety. No reviewing or massaging colors around. Barely a paralel brushtroke. The second phase is methodical and "fun" according to Calvin. One segment at a time, detail is added. But detail is not a reason to look at things "in detail" . Detail now will be kept together by the fact that the whole canvas is thickly covered. 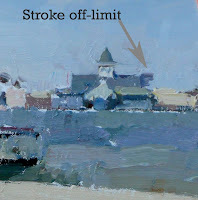 Mind you, some of the canvas peeks through in places. 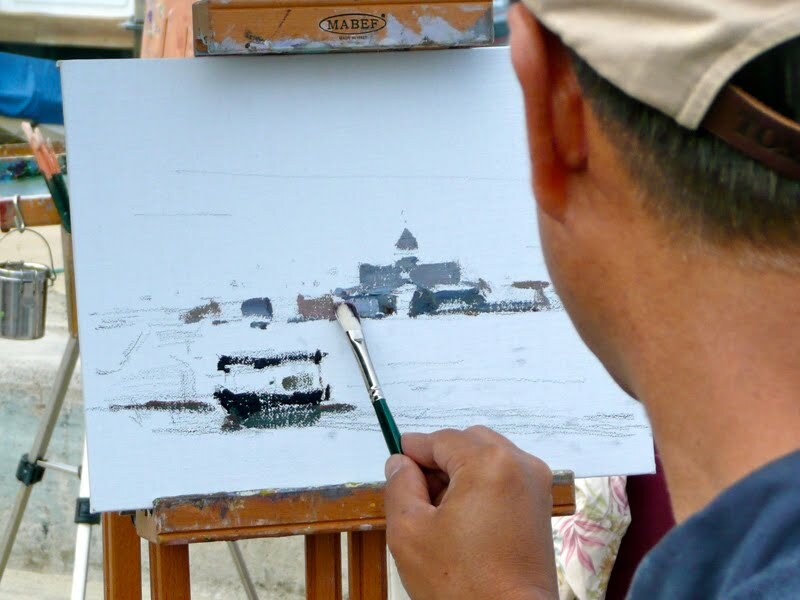 One thing Calvin avoids like the plague is the creation of lines or edges by tracing them with the brush. 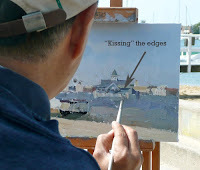 When he needs to paint an edge, he kisses with paint and "overshoots" the color. 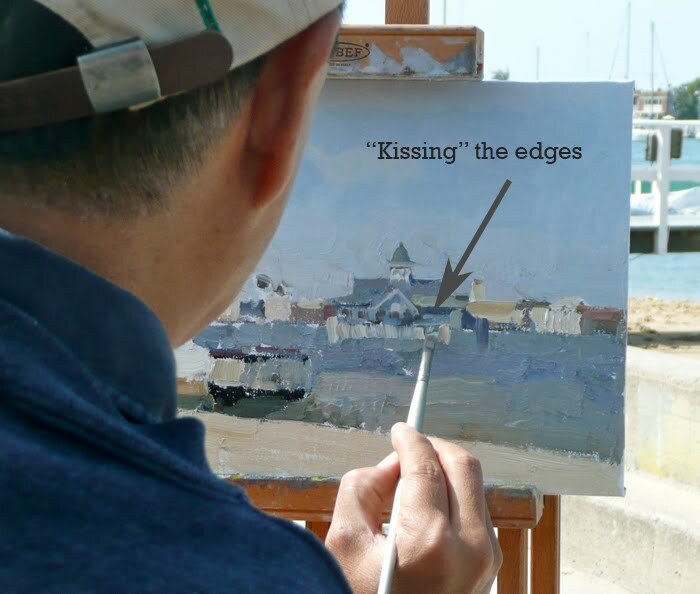 Then , with the background color, he picks up the edge and creates a very distinct and clean edge where the one layer of paint overlays another in the right places. I have to say Calvin is incredibly deliberate and quick because mistakes are few and far between. When he makes one, he mixes back the color, and covers it up to redo the area until he is happy. No matter how many times. It's a "schoolboy" approach that I find attractive since it is common to believe everything we put down is precious. Thanks for the effort in posting this class summary. You do such a thorough job, I almost feel like I attended the class. The same with some of the archived posts (e.g., Sean Cheatham). They've been very helpful to a fledgling painter. Thanks for the effort in posting this class summary. You do such a thorough job, I almost feel like I attended the class. The same with some of the archived posts (e.g., Sean Cheatham). 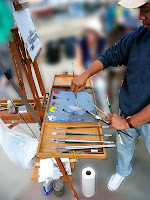 They have been very helpful to fledgling painter. You know, Jose, I hadn't read your account of the workshop before and I find your posts very interesting. I will read the rest of your posts then come back and think about this example again. 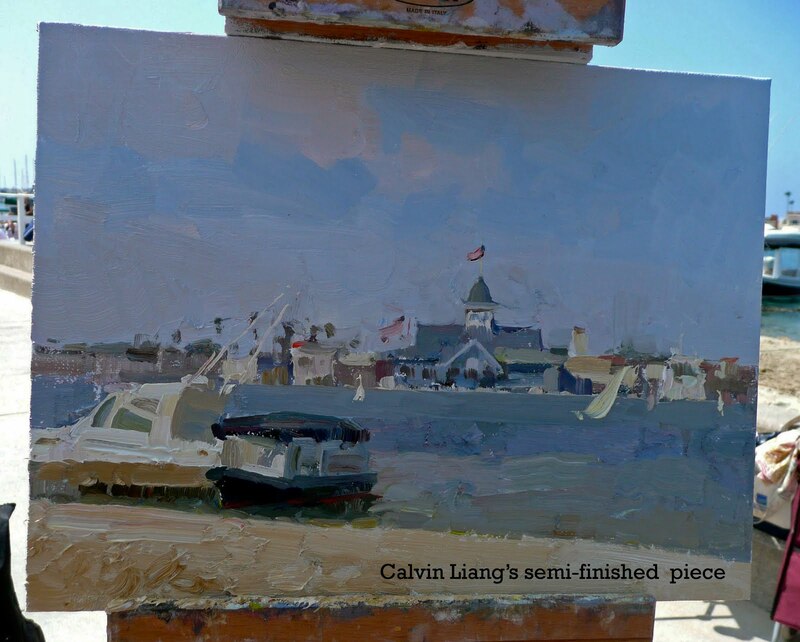 Calvin Liang's workshop. Day 3. Calvin Liang's workshop Day 2.